This post was inspired by a quote from Joe Inzerillo; ‘the internet doesn’t accept geographical boundaries, but broadcasting rights do’. Producers of television content are using the power of social media to engage their audience before, during, and after broadcasting. Also third parties like Miso, GetGlue, Trendrr, and TunerFish are reacting to the unique capabilities of the many connected and portable devices on which fans and viewers can check-in, rate, and discuss the shows they are watching. More and more series show or mention a general or episode specific #hashtag to initiate online conversations and opinions on Twitter (as shown in the #Workaholics example below). In between the broadcasting of 20 to 40 minute shows, fans are engaged on Facebook pages and Twitter accounts with unique content such as behind the scenes material, interviews, set pictures, or the performance of actors on other amusement shows. It provides a social platform to keep their audience entertainment, aware, and get them excited for new episodes. Platforms like Twitter and Facebook reach an international audience which result in a worldwide and global fan base, even in countries in which the shows hasn’t aired yet or is a month or a whole season behind because of distribution and syndication rights. These distribution rights showcase why television in its traditional form is still an ‘old medium’ compared to the basic rules that apply to ‘new media’. With the exception of dictatorial regimes and the digital divide, social media provides an open and accessible platform for people all around the world to share content and interact with friends, pages, brands, and apps. Broadcasting shows, however, are geographical limited by expensive and often exclusive contracts with distribution partners owned by the same conglomeration that created the show in the first place. As a result of geo-blocking, syndication delay, and multiple distribution partners for different geographical regions, it is almost impossible to create an effective social media campaign for a specific country without reaching and engaging an worldwide audience. And while this doesn’t seem to be an issue, it does affect the brand experience of the social audiences. Some examples from The Voice and Workaholics. 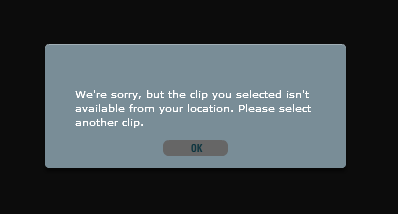 You end up on the NBC website of The Voice telling you that the clip you selected isn’t available from your location and asks users to ‘select another clip’. Without showing which clips are available worldwide the users is lost in warning messages and ends up finding other sources to see clips (YouTube and other video sites or illegal downloads). Another example is the promotion for the Comedy Central series Workaholics. The show initiated a contest for the followers of the Workaholics Twitter, Tumblr, and Facebook accounts, by which followers could win their name to be ‘checked’ of ‘shouted’ on a to episode by liking the Facebook page. The campaign is a great promotion to get attention before the start of a new season and to increase the fanbase on Facebook. However, the same rules apply as we saw with The Voice video, the sweepstakes is only accessible for people within the United States; an ‘official rule’ we see for many contests that are distributed on international social media channels. 1. NO PURCHASE NECESSARY TO ENTER OR WIN A PRIZE. A PURCHASE WILL NOT INCREASE YOUR CHANCES OF WINNING. VOID ANYWHERE OUTSIDE OF THE UNITED STATES AND THE DISTRICT OF COLUMBIA AND WHERE PROHIBITED OR RESTRICTED BY LAW. With the rise of ubiquitous databases, videos are losing their medium based specifity; they have become a utility disconnected from its traditional technology allowing television to be watched on a computer and recorded video on a mobile phone. Also, the internet allows people to watch content from everywhere, creating a form of glocalization by which people abroad (e.g. expats) can watch and access content from their home country. This practice, however, is more and more blocked and prohibited by commercial companies who are geo-blocking online content, making it only accessible for a certain region indicating an new form of media power on the internet and an artificial form of scarcity and spatial distribution. Separate online trailers, shorts, recaps, and promotion videos from traditional distribution rights and make them available for anyone. This will not only result in a larger audience but also prevents fans from being disappointed. Create country specific pages and use Facebook functions to filters audience for countries or regions. Facebook allows you to target specific post based on location or language. Be aware of your online audience. What are the demographics when it comes to geographical reach, what’s the goal of your online channel, and how do you make sure you communicate that goal to your online audience. Redirect audiences to a national website or provide alternative videos within the player instead of stating that the video can’t be played. Recognize the visitor of your website and adapt the content that is available or promoted. Here lies a big challenge for developers to provide an unique experience for any visitor no matter their location. Change your distribution policy and provide worldwide coverage. 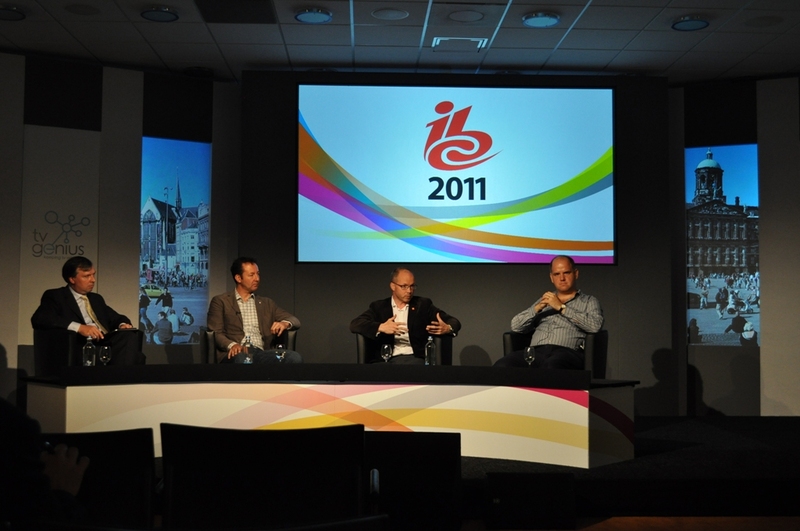 YouTube provides an infrastructure to show local advertising for international videos. A great example are the online episodes of South Park. 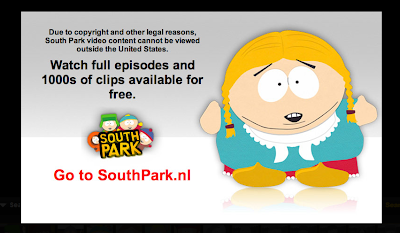 When you visit the American website form Holland, it redirects visitors to the Dutch version of the site with ads targeted for that audience (although this is still based on distribution rights). This conflict between television rights, policies, and contracts, and the international and accessible character of social media, indicates how traditional formats and standards need to be reconsidered and ultimately reconfigured to make sense in a connected world.